This species is quite variable, and now includes many forms (previously considered independent species). 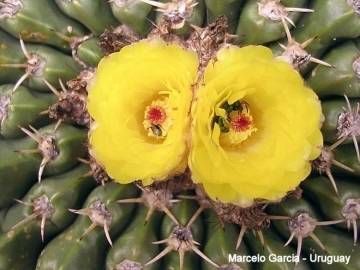 The flowers are lemon yellow with glossy petals, the stigma (purple) with about 8 to 10 red lobes, emphasize the yellow of the petals. 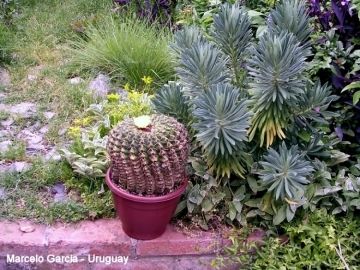 Origin and Habitat: Parodia sellowii is native to southern Brazil (Rivera, Lavalleja, Treinta y Tres, Artigas, Cerro Largo, Maldonado), Uruguay and North Argentina. It has a wide range, a very large extent of occurrence, and it is locally abundant. Altitude: It can be found at elevations between 0 and 420 meters above sea level. 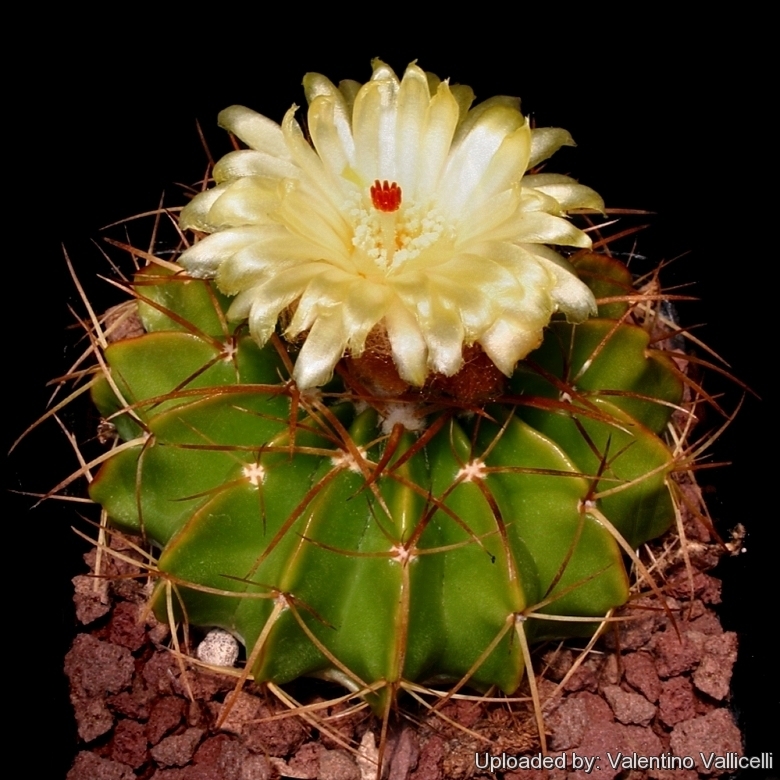 Habitat: This cactus grows on rocky outcrops in grasslands or pampas. The major threat to this species is cattle and sheep grazing because the specimens are ingested and trampled. very woolly stem apex. 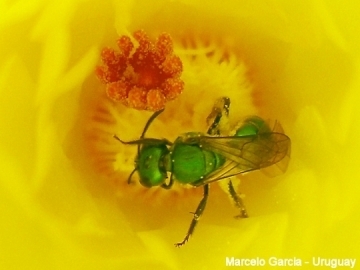 It is a widespread, extremely variable species that has received numerous unnecessary names (at least 120), representing no more than local phenotypes. 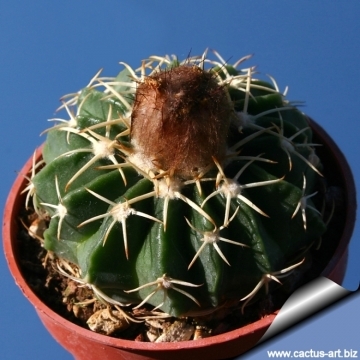 Stem: Broadly orbicular flattened and growing partly underground, but the plant's stem in cultivation is usually globular or ovoidal and aerial, up to 20 cm tall, 15 cm in diameter, bright glossy green, dark green or grey-green. The apex is depressed and filled with whitish-grey wool. Ribs: (12-)16-18(-22), at maturity well marked, shallow more or less sharp, with scarcely prominent chinned tubercles. The crest of the ribs typically turns a purple red colour in full sun. 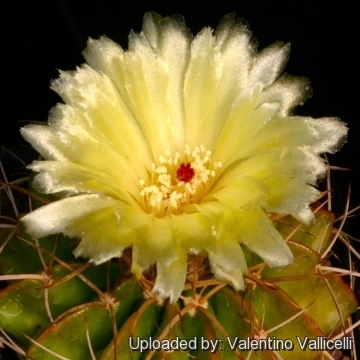 Radial spines: 4 to 10 (-12), yellowish, sturdy, about 20 mm long, curved down or backward. Central spines: 0 or 1, slightly heavier but not very different from the the radials. 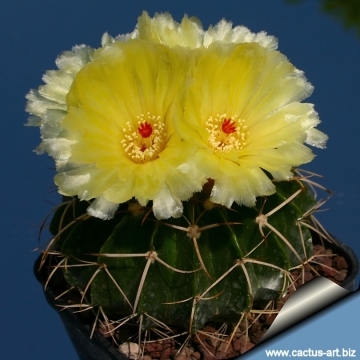 Flowers: Lemon yellow with glossy petals (sometime shaded with pink), up to about 4-5 cm in diameter, and standing near the top, decorated with about 8 to 10 red pistil lobes which emphasize the yellow of the petals. The buds are tomentose. Blooming season: They bloom annually around July. Fruits: Fleshy reddish to purple, about 10 mm long. 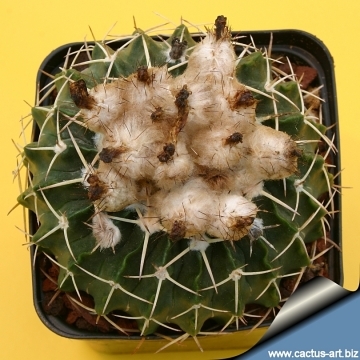 Seeds: 1 mm, long, black. Remarks: When the plants become older they look quite different from the juvenile forms, and this is evident when we can observe a seedling growing next to an older plant - the younger plant is smoother and the older plants have ribs and tubercles - one would almost think they were different species. 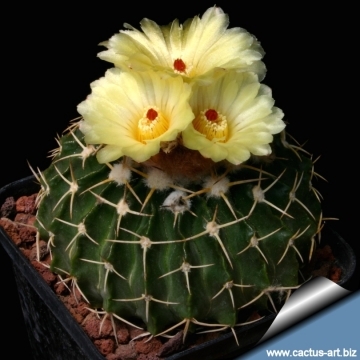 Cultivation and Propagation: Parodia sellowii is an easy to grow tropical cactus that like a warm bright location, but more cold tolerant than most and less fussy regarding soil conditions.